Field Marshal Sam Hormusji Framji Jamshedji Manekshaw died in Wellington, India last Friday, aged 94. He was the best-known soldier in India, and pivotal in that country’s victory in the 1971 war with Pakistan, which liberated East Pakistan and gave birth to Bangladesh. In his later days his routine was to get up early, drink a shot of whiskey, listen to the news on the BBC, and then work in his garden… RIP, Sam Manekshaw. Aahh, the good old “Beeb”, the main source of international news re what was happening around the world. Growing up in Bombay in the seventies and early eighties, this blogger’s family would tune in every day… the Bombay newspapers mostly having local/national stories, the local TV news full of exciting fare such as “… an additional 35 villages electrified”; “50 new wells dug…”; “… the production quotas of the 5-year plan being exceeded”; a bus plunging into a gorge killing 65 with the driver “absconding” (Ed. note: for fun go ahead and google “bus” ,“abscond” and “India” to get over 6,000 hits up to the present day! ); etc. Real news came via the BBC, other incredibly valuable resources being (in descending order) the British Council Library, and the U.S. Information Agency library. The USIA was a GPO depository, so this blogger would read the minutes of (U.S.) Senate and House proceedings and be amazed and astounded by the openness of the discussions, even those related to the military and defense. This blogger became somewhat of an expert on U.S. defense hardware and missiles – “slickums”, “glickums”, etc. (Ed. note: SLCM – sea-launched cruise missiles; GLCM – ground-launched cruise missiles). Ed. 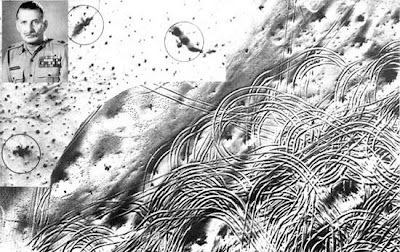 note: The picture is of Pakistani tank tracks at Logewala, left after their desperate maneuveres to avoid destruction. At Longewala an Indian company of approximately 120 soldiers held off a Pakistani force of 2000-3000 backed by the 22nd Armoured Regiment for two days, until the IAF arrived to destroy the Pakistani assault.